> Get Sauced With Sass! 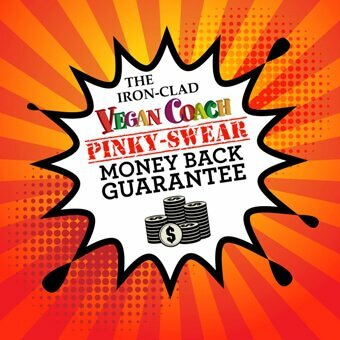 "Vegan Coach combined with my blender is just so unbelievable! No waste, I can use up things that I don't particularly like or know what to do with, add nutrition to the meal and most important for me - I can do it all in a hurry. I just can't believe it. Every time I make a sauce, it feels magical." Welcome to Get Sauced With Sass, a one-of-a-kind freestyle vegan sauce-making class. There is simply no other online vegan class like this out there! We'll show you how to create healthy and mouthwatering quick vegan sauces that turn any meal you make from boring to sinful-tasting — without a smidge of guilt. A Quick Summary of Get Sauced With Sass! 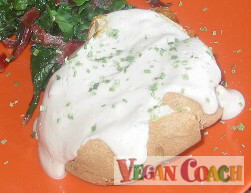 Are your vegan meals bor-ing? When you hear "rich and creamy sauce", do you think of long and difficult recipes that only a top chef could create? Sauces stuffed with cream and butter and cheese and other cholesterol-raising and artery clogging ingredients? What if I told you that you can learn to make delicious, creamy, dreamy sauces quickly and easily. Would that sound good to you? I promise you, sauces are the key to a satisfying nutritious whole-foods diet. My sweet, there is no reason under the sun why you can't eat a plant-based diet that satisfies AND nourishes your body at the same time. I'd love to show you how easy it is to use the whole food ingredients you have on hand to create healthy and yummy quick sauces. In fact, you will be so surprised how easy it is to make your own sauces from scratch, that you'll wonder how you ever made your meals without them! With 30+ videos, you'll walk away with sauce-making ideas that you can play around with in your own kitchen. These videos offer the guidance you need to put the tips and techniques you'll learn in class into practice. They not only teach you as you watch but offer inspiration, too! We also cover how to make a sauce with the perfect consistency you're after so it isn't too thin or too thick. Guys, this is just the start. There is so much more we'll cover in this fun and creative six-week online class. Get Sauced! is jam-packed with tips that will help you to easily get started right away making sauces with the plant-based ingredients you have on hand. Once you add in all the Lessons and videos -- plus, all the sauces and amazingly helpful questions and discussions your fellow classmates are posting in our friendly private forums -- and you'll walk away super excited about your new saucy adventure. In fact, begin the class today, and you'll be making a sauce with your din-din TONIGHT. "This class has inspired me to do a lot more experimenting than usual. Maybe it’s because it is easy to make a small quantity of many of the sauces. My mind just can't seem to stop. My confidence in trying new ideas has jumped higher than I expected. Yay!" "The videos and the community add soooooo much to the learning experience. I love to read, but I need visual stimulation as well as feedback to keep me creating." "For me, there is just nothing like watching the demo videos." Check Out These Drool-Worthy Sinful-Tasting Sauces Created In Class! These beautiful sauces were made by our students. Can you do this, too? Absolutely. "Vegan Coach combined with my blender is just so unbelievable! No waste, I can use up things that I don't particularly like or know what to do with, add nutrition to the meal and most important for me - I can do it all in a hurry. So easy to prepare and then we have a meal with a sauce that is so special. I just can't believe it. Every time I make a sauce, it feels magical." "I have learned a lot during this class and still have a lot to still completely absorb and master. But I have the handouts and I have been practicing and I have this course I can come back to refresh my brain about what someone created, questions & comments that were posted, videos to watch, and lessons to revisit and learn from. I am so very thankful and appreciative for this course and all it encompasses including the people involved." This hands-on, step-by-step instruction of how to create and flavor your sauce means you can repeat these techniques over and over and over again. So you'll free yourself from the bonds of recipes and allow your creativity to shine through as cooking becomes fun. As you gain an understanding for the ingredients you are adding to your sauce, you can create a sauce at any time with the ingredients you have on hand. These are ingredients that most whole-foods kitchens are stocked with like nuts, seeds, tofu, beans, vegetables and whole grains. And these are the foods that you will learn to use in creating your very own unique sauces. So your sauces are winners that taste great and are healthy for you too. 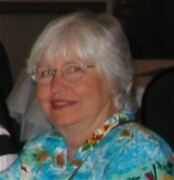 The entire course offers gentle guidance. In fact, since most of the techniques taught in GSWS can work with any whole-foods cooking you do, you'll become a better cook. That's because as you learn many cooking basics to build a winning sauce, you can easily translate these basics to other dishes. So you can create whole-foods dishes at any time with the ingredients you have on hand. What does this mean for you? Very little meal planning, since you can build an entire meal quickly and easily. 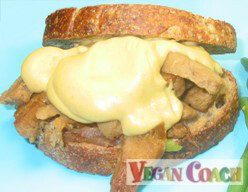 We call this "freestyle cooking" and it goes to the heart of what we teach here at Vegan Coach. Imagine how excited you will be to get into the kitchen to whip up a yummy and healthy meal. The sauces you'll create are good for you made with the healthy whole food fats your body needs. There's a world of difference between sauces made with cholesterol-free healthy fats (such as avocado, extra-virgin olive oil, nuts, seeds, and organic tofu) vs. cholesterol-packed and rear-end maximizing fats (milk, butter, and cheese). 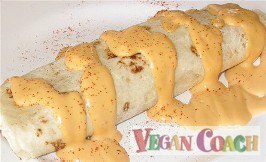 You can enjoy these creamy, comforting and delicious sauces every day if you'd like. Without the guilt! Your course has opened my eyes to another realm of sauces. I've been vegan since 1994. So you can say that I'm experienced in a plant-strong diet and creating sauces that can make every meal special. Not only that, but these sauces are the KEY TO MY VEGAN DIET SUCCESS. Every one of the successful techniques you'll discover come from my very own hands-on experience. You'll learn everything I know about creating your perfect sauce from scratch without a recipe -- in a fraction of the time it took me! Remember, this is not just a collection of recipes! Get Sauced! helps you free yourself from the bonds of recipes. What does this mean for you in your kitchen? You can develop your very own tasty sauce at any time and with any ingredients you have on hand. I promise you'll become more creative in the kitchen and feel empowered to create. Cooking becomes fun! Get Sauced! is made up of our Get Sauced With Sass! online class that goes hand-in-hand with a comprehensive downloadable eBook and includes 30+ videos and our friendly and unique forums. The online class and the ebook work together to walk you step-by-step through the sauce-making techniques I use — and that you'll learn, too. Uses for sauces: Discover the vegan foods that just beg for a sauce. This opens your mind to ideas that are possible. Your meals will be more interesting and fun to create, so you enjoy yourself in the kitchen - FINALLY! Glossary of Ingredients: Whole-foods ingredients are important to your success. With this handy glossary, you'll adapt more quickly to new and interesting foods so you'll feel confident in this new adventure. How To Build A Sauce: What can you use for the base of your sauce? Which liquids work best for the proper consistency? What about healthy fats for a rich mouth feel? You'll learn how to choose each whole food component of your sauce so it all works together beautifully and successfully. Flavoring Your Sauce: Develop an understanding of how flavors work with each other in harmony. We cover flavor matching and how to balance your sauce. You'll play with your food and create sauces according to your personal taste. Flavor Techniques: This is fun. You'll learn how to match your sauce to your main dish. Herbs & Spices: Often overlooked when creating in the kitchen, you'll learn which flavor each herb and spice listed will bring to your cooking. This helps you develop an understanding of the important part herbs play so your dishes are more flavorful. Consistency Tips: Learn how to achieve the proper consistency for your sauce. You'll create sauces according to your perfect taste. 30+ Videos: These videos provide you a library of sauces! You'll watch as I demonstrate my easy sauce-making techniques. These visuals will help you make associations with the written and online material so you can find saucy success more quickly. Unique Forums: Our students LOVE our helpful and friendly forums. Ask any questions you have as you make your way through class. Post photos your saucy creations the rest of the class can cheer you on. Gentle advice is offered if requested. The forums are where a lot of the most important connections are made not only to the material but to other students as well. One of my secrets to making a sauce that satisfies? Rejuvelac! 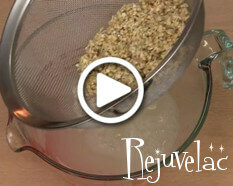 In this BONUS VIDEO, I'll show you how to make Rejuvelac from scratch. As I mentioned above, this is a pre-biotic beverage that helps your gut to make probiotics. What does this have to do with sauce-making? Because in addition to being good for you, you can use Rejuvelac in your sauces so they're richer and more complex, intensifying the flavors and making every sauce super satisfying! This bonus also includes an additional forum so you can ask any questions about the process. I'll be there with you every step of the way! Flavor matches take the guesswork out of cooking. GSWS! uses flavor matches that can be found throughout our website. But this eBook goes further and includes far more matches for you to play with in your kitchen. Flavor Matches are simply the easiest and fastest way to create sauces that are yummy and good for you by simply using what you have in your cupboards and fridge at any given time. IF YOU DON'T WALK AWAY FROM THIS CLASS COMPLETELY INSPIRED AND EXCITED ABOUT YOUR NEW SKILLS WHIPPING UP CREAMY SAUCES WITHOUT A RECIPE, THE CLASS IS FREE. The best part is, sauces can be ready in minutes, because delicious and nutritious does not have to mean time consuming. With GSWS! there is simply no huge time commitment to whip up a yummy sauce to match your meal. You'll be in and out of the kitchen so you can sit down, relax and enjoy your meal with loved ones. The possibilities for vegan sauces you can create on-the-fly are never-ending. p.s. Remember, you receive my personal money-back guarantee. You have nothing to lose, and a future full of yummy, creamy and dreamy easy-to-create sauces to decorate your favorite dishes. Q: "How many recipes for sauces in your book include or require soy? Do you suggest alternatives? I am allergic to soy and too often have purchased books and found a good portion of them unusable for me for that reason." A: The course is unique because YOU will choose the ingredients to create your sauce (based on my recommendations). There is absolutely no reason to use soy, although soy options are there for those who do. You simply choose from base ingredients such as beans/whole grains/veggies, liquids such as veg broth/water/non-dairy milk, healthy fats such as avocado/nuts/coconut, and herbs/spices/whole food flavorings to create your own winning sauce. Basically, I provide the ingredients and the instruction, and you play Mix & Match. Q: "Can you post on your website or send me a few sample recipes?" A: This is not a recipe book in the traditional sense. If you are looking for recipes you can follow, then this is not the course for you. Instead, GSWS! teaches you sauce-building techniques so you can create health-supportive and yummy sauces from scratch - without a recipe. In order for me to share how I create sauces in my own kitchen, it was necessary for me to completely deconstruct my techniques, and figure out a way to teach them in an easy-to-understand manner. Beans and rice and veggies are an easy and inexpensive way to eat a healthy plant-strong diet. But sometimes they CAN get a little boring. The simple addition of a sauce can make a world of difference between a ho-hum meal and a dish that will make you excited about eating again. Q: "I'm wondering if Get Sauced! is essentially gluten free as well? Thanks a bundle." A: The course is unique in that we teach you how to cook without any recipe to guide you. That means that YOU choose the ingredients you want to use. Can't eat gluten? No problem! No oil? No need to use it! There is absolutely no reason to use ingredients which contain gluten if you are, in fact, gluten-free. You simply choose the ingredients you have in your very own cupboard to create your own winning sauce. Q: "I'm interested in your sauce class but had a question. For health reasons, I need to leave out fat, even the good fat from avocados, etc. Will I still be able to make sauces using your guidelines? Thank you!" Q: "How do I know if this course will fit into my schedule?" Q: How do I download the eBook portion of the course? A: After your purchase, you will receive a link to join us in class. Once there, you'll download the eBooks Get Sauced With Sass! and Your Quick Guide To Flavor Matches. 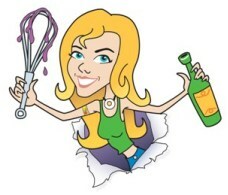 If you have a question you'd like to ask about Get Sauced With Sass! just send me a note through my contact form. "I've been 100% vegetarian and about 95% vegan for 7 years or so. I am loving your course! 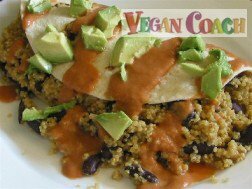 I was looking for ways to create my own sauces, and I actually have a pretty extensive vegan cookbook collection." "Sauces are such good stuff with veggies and it's actually hard to find good references. I like the concept that you use." "I just wanted to say thank you. Your "Get Sauced with Sass!" course gave me the courage to create a sauce out of pureed bell peppers from scratch, that will become a new staple in my diet." I love Get Sauced with Sass! I totally feel empowered to make my own vegan sauces. Of late I have made Ranch dressing, Alfredo Sauce, and cheesy pasta sauce, all out of cashews and macadamia nuts. Huge, huge fan. Please keep up all the great work!" "I've been reading through the course and it is absolutely amazing; all the information I was looking for and more." Back to the top - Get Sauced With Sass!